Flanders Arts Institute | Music | deFilharmonie, Edo de Waart, Wim Henderickx, Martyn Brabbins: At the edge of the world / Empty mind I / Groove! (...) "an excellent introduction to his music. His Symphony No 1 is an architectural tour de force, bursting into vibrant life before an explosive climax. The rhytmically propulsive 'Groove! 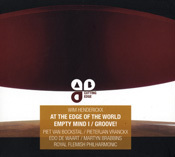 ', featuring the impressive Pieterjan Vranckx on percussion, is more direct but equally as effective. Powerful stuff."